Posted on Thu, Feb 23, 2012 : 5:58 a.m. This Sunday evening, the very funny Billy Crystal will again host the Academy Awards. Who will win? Who knows, and to a certain degree, who cares? The Oscars hype and show are fun, but don’t take it too seriously.Â Very few bad films or artists get Oscars, and who really knows which films and artists will be venerated by future generations - that’s for the generations to come to decide, cultural history scholars to ruminate upon and articulate a century or so from now. So, in the here and now, enjoy the pop-culture glamour and the notion that the art and craft of cinema is still widely celebrated by a media-mad society. There is still a chance to see some Academy Award nominees before the big event this Sunday! “The Artist” is a heartfelt and entertaining valentine to classic American cinema - and is the odds-on favorite to with the Best Picture Oscar. “The Artist” continues at the State Theatre. In “Albert Nobbs,” six-time Academy Award nominee (including a nomination for this film) Glenn Close stars as a woman who lives as a man in 19th-century Ireland. Roger Ebert of the Chicago Sun-Times says, “This is such a brave performance by Glenn Close.” In addition to a Best Actress Nomination for Close, Janet McTeer also received a Best Actress in a Supporting Role nod, and the film also received a nomination for make-up. “Albert Nobbs” continues at the State Theatre. The 2012 Oscar-nominated short films continue at the Michigan Theater! Come and watch the best in live action, animated and documentary short films at the Michigan Theater. These are all wonderful, not-to-be-missed films. "Act of Valor,” an unprecedented blend of real-life heroism and original filmmaking, stars a group of active-duty Navy SEALs in a powerful story of contemporary global anti-terrorism. Inspired by true events, the film combines stunning combat sequences, up-to-the minute battlefield technology and heart-pumping emotion for the ultimate action adventure. "Act of Valor” opens Friday. In "Gone," Jill Parrish (Amanda Seyfried) comes home from a night shift to discover her sister Molly has been abducted. Jill, who escaped from a kidnapper a year before, is convinced that the same serial killer has come back for her sister. Afraid that Molly will be dead by sundown, Jill embarks on a heart-pounding chase to find the killer, expose his secrets and save her sister. “Gone” opens Friday. In Tyler Perry's “Good Deeds,” Wesley Deeds (Perry) has always done what's expected of him. But Wesley is jolted out of his predictable routine when he meets Lindsey (Thandie Newton), a down-on-her-luck single mother who works on the cleaning crew in his office building. “Good Deeds” opens Friday. Paul Rudd and Jennifer Aniston star in "Wanderlust," from director David Wain ("Role Models") and producer Judd Apatow ("Knocked Up"), about a couple who leave the pressures of the big city and join a freewheeling community where the only rule is to be yourself. "Wanderlust” opens Friday. The Neutral Zone’s freNZ Committee invites Ann Arborites to dress in their finest “red carpet” attire and enjoy an evening of film, music, drinks, food, and Tinsel Town glamour in support of Neutral Zone programs. Held in the historic Michigan Theater, the evening will feature music by Neutral Zone teen musicians, film shorts, and a dance party. 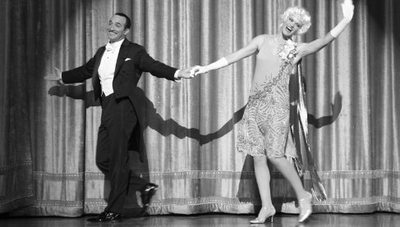 “Vintage Hollywood: Take 3” takes place Friday, Feb. 24 at 7 p.m. In “Bill and Ted’s Excellent Adventure,” Bill (Alex Winter) and Ted (Keanu Reeves) look to be doomed as they prepare to flunk all their finals. But with the help of Rufus (George Carlin), an emissary from the future, they set off to retrieve a few historical characters—including Joan of Arc, Abe Lincoln, Napoleon and Beethoven—to bolster their sagging grades. “Bill & Ted’s Excellent Adventure” plays Saturday, Feb. 25 at 11:59 p.m. at the State Theatre. Martin Bandyke's Moving Pictures Film Series continues with “8 Mile.” Detroit rap star Eminem makes his acting debut in a film inspired in part by incidents from the musician's own life. Jimmy Smith, known as Rabbit (Eminem), has had a hard climb his entire life, and it certainly hasn't gotten any easier lately: He has been dumped by his girlfriend, he has moved back in with his emotionally unstable mother, Stephanie (Kim Basinger), and he's getting along especially poorly with Stephanie's new boyfriend. His job is tough, demeaning and doesn't pay especially well, and he's convinced his skills as a rapper are his only real hope at a better life. The film was shot on location in Detroit by director Curtis Hanson. “8 Mile” plays Monday, Feb. 27 at 7 p.m.
Thu, Feb 23, 2012 : 5:32 p.m. I look forward to Tyler Perry's next movie, &quot;Tyler Perry's Tyler Perry: the Motion Picture&quot; starring Tyler Perry. He'll have to find a way to work his name into his work somehow, though. It would be unfortunate if it weren't widely known he was involved in the film. Thu, Feb 23, 2012 : 5:39 p.m.
Thu, Feb 23, 2012 : 3:24 p.m. Looking forward to Oscar Night as usual. Thu, Feb 23, 2012 : 2:55 p.m.
8 Mile gets less credit than it deserves, most likely either due to the involvement of Eminem, or because it gets unfairly lumped in with other, mostly terrible, rap-themed movies. Agreed about the Oscars - Watch it for the pomp, the fun, and the spectacle, but don't tear your hair out over it. Thu, Feb 23, 2012 : 1:57 p.m. I heard that &quot;The Artist&quot; is an excellent film. I hope to see it before it stops it's run downtown.